On October 5th IUP will host the first IUP Tubaphonium Day. Our guest artist is Jeremy Lewis from West Texas A&M. Tubaphonium Day is a chance for tuba, euphonium, and baritone players of all ages to join the IUP Tuba and Euphonium Studio for a day of performance and learning. Participants will be able to participate in master classes, perform as part of a mass tuba-euphonium ensemble, and hear performances from Jeremy Lewis and the students and faculty of IUP. The event is FREE! Contact Zach Collins at zcollins@iup.edu or 724-357-2899 for more information. 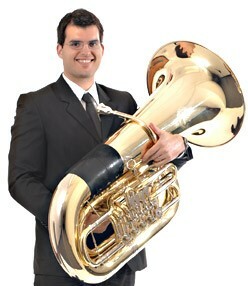 principal tubist with the Amarillo Symphony Orchestra. degrees from Texas Christian University, Indiana University and Texas Tech University. Tuba and Euphonium Conference Artist Tuba Competition.